Many presidents have had contentious relationships with the press. President John Adams’ 1798 Sedition Act made publishing anything critical of the government illegal, President Theodore Roosevelt tried to sue the press for unfavorable coverage and other leaders have tried to control the flow of information. However, the animosity towards the press fostered by President Donald Trump many believe is unprecedented. For news, analysis, history & legal background read on. A Trump 2020 campaign official tweeted that Jim Acosta, CNN‘s White House Correspondent, should have his press credentials suspended for asking Trump and Kim a question during the summit’s signing ceremony. The Associated Press reports that the governor of Maine, a New Mexico congressional candidate, the Georgia secretary of state and the vice chairman of Trump’s now-disbanded voter fraud commission all leaned on “fake news” in deriding opponents. Others have also brandished the term as a weapon against journalists doing investigative reporting. As “fake news” become more ubiquitous, press freedom is diminished say experts. On Thursday, doctored tweets started circulating that assumed reporters’ identities, substituting fake text for the original tweets. Miami Herald reporter Alex Harris was one of the first to reach out to students about what was going on at Marjory Stonemason Douglas High School as a shooter rained chaos on campus. Soon after, doctored tweets attributed to her gained steam and the twitter universe exploded with accusations Harris was racist. “I had literally thousands of messages and they just filled up my mentions and DMs with terrible, racist, sexist, horrific, graphic death threats,” Harris told Buzzfeed. A report last year by the news service indicated Twitter was failing to crackdown on online harassment. 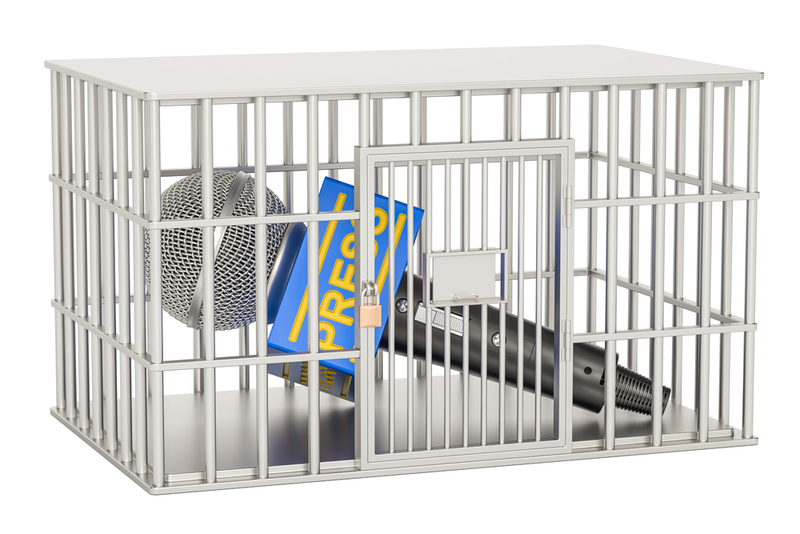 CJR reviews what has happened to journalists over the past year – and what may be in store. With attacks both verbal and physical against journalists on the rise, California Democratic Representative Eric Swalwell has introduced the Journalist Protection Act. “I seek to protect the CNN journalist as much as I seek to protect the Fox News journalist,” he told The Hollywood Reporter. A Trump ally, former Milwaukee Sheriff David A. Clarke, Jr., was blocked temporarily from Twitter after a now deleted tweet called for violence against the media. Politico posits that the relentless tirade of “fake news” allegation against the media has enabled Roy Moore to defend himself against allegations of sextual abuse. Video capturing the arrest of Shareblue Media’s Mike Stark show police officers aggressively confronting Stark. Fairfax County police are investigating. Did Stark break the law or was he being targeted and silenced? When St. Louis Post-Dispatch reporter Mike Faulk was arrested for covering the September 17th protest after the decision to acquit Jason Stockley, the white ex-police officer who fatally shot Anthony Lamar Smith, a black man, in 2011, editors responded aggressively. Nearly two dozen press freedom organizations joined to track abuses against the press. Some analysts speculate the Trump could hold up the AT&T / Time Warner deal because of a long-simmering rift with CNN. Trump took to Twitter several times in early July calling out CNN as “Fake News” and “Fraud News” and including a meme of him bashing a CNN reporter. I am extremely pleased to see that @CNN has finally been exposed as #FakeNews and garbage journalism. It’s about time! May 16, 2017: Did Trump Encourage Comey to Jail Journalists? In an appearance at the Conservative Political Action Conference, the President continued his attacks against the media. Taking to Twitter, President Trump called the news media “the enemy of the American people. SICK” He quickly deleted the tweet and then replaced it with something similar. On the Today Show, Matt Lauer asked Bush: “Did you ever consider the media to be the enemy of the American people?” The President replied: “I consider the media to be indispensable to democracy. We need an independent media to hold people like me to account. Power can be very addictive. And it can be corrosive. And it’s important for the media to call to account people who abuse their power, whether it be here or elsewhere.” Go to 2:15 of the interview. A reporter for American Urban Radio Networks claimed that Omarosa Manigault, a communications official in the White House, “physically intimidated” her and asserted that officials had collected negative information about her. The President attacked U.S. District Judge James L. Robart after he temporarily blocked the White House immigration order that denied entry to persons from seven countries with majority Muslim populations. In a speech, Trump also blamed the media. The Federalist points out that journalists have been hounded in different historical periods. Times were tough under President Adams whose 1798 Sedition Act made publishing anything critical of the government illegal. Theodore Roosevelt tried to sue newspapers for their coverage of the Panama Canal. Other presidents have restricted press access and played favorites with different outlets. So today’s press then seems to be and states “hyperventilating” according to the Federalist and needs some perspective. Simon Tisdall writes in The Guardian that President Trump’s war against the media not only threatens the integrity of truth, but gives license to creating an environment of actual danger for journalists all around the world.